Diving board to the deep end of college. About to spring, flip and jam out a graduation sized splash in the pool. Life is about to get wet and I'm looking for a slip and slide. I see economic incentives in waste as potential or making solutions for tangible problems. Life will be different than what I thought. Everything is now done and gone from the senior show. It is all in storage, awaiting another iteration. In twelve hours, six tons of lamp poles were erected. 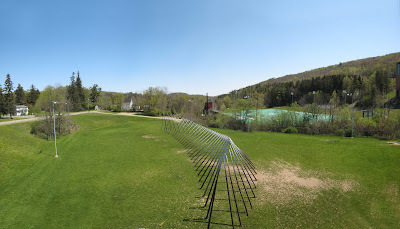 The resulting sculpture was charged with light, and then viewed at night as a mass of glowing lines hanging in the air. Perfect.